Vanilla Cupcakes are so lovely with their swirls of Confectioners (Buttercream) Frosting. Gone are the days when they were only served at children's birthday parties dressed with a quick swipe of frosting and a sprinkling of colored sugar. Today's cupcakes show up everywhere, from adult birthday parties to weddings and their decorations range from the very simple to stunning works of art. Cupcakes are usually baked in a 12 cup muffin pan that has been lined with fluted paper liners. The paper liners make the cupcakes look pretty, keep them moist, make them easy to release from the pan, and also make clean up a breeze. These delicious Vanilla Cupcakes start with a white cake batter. The batter is mixed using the 'creaming' method which produces a cupcake that is light and airy with a soft crumb. When making this cake batter have the butter, eggs, and milk at room temperature. 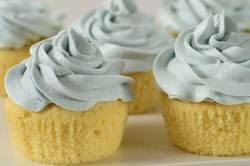 (Information on making Butter Cakes) In order to have a moist cupcake, it is important not to over bake them, as over baked cupcakes are dry and crumbly. So always check the cupcakes a few minutes before the stated baking time. Ideally when you first check them you want to see just a few moist crumbs clinging to the toothpick. That way you know that the cupcakes have just a few more minutes of baking time. Because if the first time you check the cupcakes the toothpick comes out clean, this could also mean that they have been over baked. Once the cupcakes are baked and completely cooled, we will frost them with a sweet and buttery confectioners (buttercream) frosting made from butter and confectioners (powdered or icing) sugar, with a little vanilla extract for flavoring. While covering them with just a thin layer of frosting makes them ideal for everyday, you can make them more decorative with a piping bag fitted with a decorative tip (in the picture I used a Wilton 1M star tip). To dress them up even more, garnish with fresh or candied flowers or a sprinkling of colored sugar. The name "cupcake" was used differently back in the 1800s. Then the name "cup cake" simply referred to a cake where the ingredients were 'measured' not 'weighed'. It seems that before the 1880s ingredients for cake baking were actually weighed so when recipes started to be given in 'cup' measurements, the cake recipes were named 'cup cakes' to reflect this difference. Greg Patent also tells us in his book 'Baking in America' that a woman named Mrs. Rorer (in 1902) was the first to actually print a recipe for the cupcakes (with frosting) we all enjoy today. Evenly fill the muffin cups with the batter and bake for about 17 - 20 minutes or just until set and a toothpick inserted into a cupcake comes out clean. (Always check a few minutes before the stated baking time. Do not over bake or the cupcakes will be dry.) Remove from oven and place on a wire rack to cool. Once the cupcakes have completely cooled, frost with icing. If you want flat topped cupcakes then slice off the dome of each cupcake, with a sharp knife, before frosting. If you want to pipe the frosting, I like to use a large Wilton 1M star decorating tip. Cupcakes are best eaten the same day they are made, but they can be covered and stored for a few days. Confectioners (Buttercream) Frosting: In an electric mixer, or with a hand mixer, cream the butter until smooth and well blended. Add the vanilla extract. With the mixer on low speed, gradually beat in the sugar. Scrape down the sides of the bowl. Add the milk and beat on high speed until frosting is light and fluffy (about 3-4 minutes). Add a little more milk or sugar, if needed. Tint the frosting with desired food color (I use the paste food coloring that is available at cake decorating stores and party stores). Hay, Donna. Modern Classics Book 2. Harper Collins Publishers Inc. New York: 2003. Patent, Greg. Baking in America. Houghton Mifflin Company. New York: 2002.